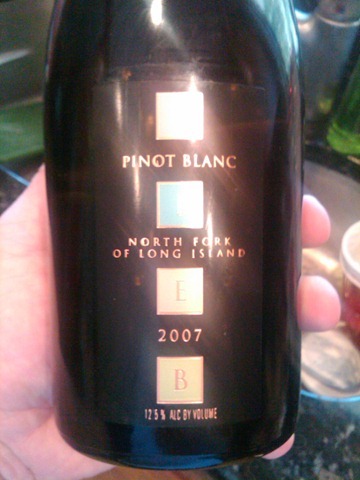 Posted on June 17, 2010	by Michael Gorton, Jr.
You don’t see Pinot Blanc too much on Long Island. The only vineyards that release a varietal of this variety is Palmer Vineyards and Lieb Family Cellars. I know that Shinn Estate Vineyards is doing something with their first from 2009, but I am not sure what it will be just yet. I used this bottle of Lieb Family Cellars 2007 Pinot Blanc ($20) for exploration and for an experiment with my mother-in-law. I am on a crusade to convert her from drinking Pinot Grigio. It is like fingernails on a chalk board every time we go out to dinner. “I’ll have a glass of Pinot Grigio” or when I am pouring wine, “Does it taste like Pinot Grigio”. UGH! I am trying and I have been somewhat successful. And to my surprise, she liked this bottle of wine alot. On the nose I was getting some pear and melon with a hint of orange. There was some floral notes with a hint of vanilla and toasted almond. The taste had a note of grass and river rocks. There was a bit more of the pear and vanilla on the finish with a hint of grapefruit. I did enjoy this bottle. I had it with some light apps and some grilled chicken sausage. It went very well with both. The highlight of this bottle was when my mother-in-law gave it her stamp of approval. I recommend you give it a try as well, it is a good alternative for your summer sipping. This entry was posted in 2007, Lieb Cellars, Pinot Blanc, White Wine. Bookmark the permalink.